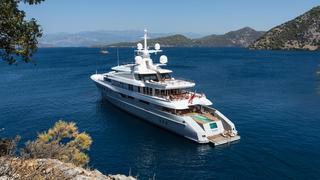 The 72.5 metre motor yacht Axioma, listed for sale by Russell Crump at Yachting Partners International, will be available to view during the Monaco Grand Prix from May 26 to May 29. Built in steel and aluminium by Turkish yard Dunya Yachts to a design by Sterling Scott, she is ABS classed and was delivered in summer 2013, going on to win a Judges’ Special Commendation at the 2014 World Superyacht Awards. A beach house-style interior by the late Alberto Pinto contrasts natural woods and luxurious flourishes to create a voluminous interior accommodating 12 guests in six generous cabins. On the owner's private deck there is a double stateroom, his and hers en suite bathrooms, a cinema/lounge and a dining terrace. There are also no fewer than three VIP double suites and two guest cabins convertible from twins to doubles. All cabins have en suite bathroom facilities and come with television screens and entertainment systems. A spectacular feature of this yacht for sale is the huge double-height main saloon extending through the main and upper decks, while the main deck has an infinity swimming pool. The sun deck has lounging and intimate seating areas forward, while aft is more al fresco dining, a large spa pool surrounded by sun pads and a bar. Other features include a heli-pad, a large health and beauty spa and a gymnasium. As an added attraction, two teak balconies at the stern fold down over the sea, nearly doubling the size of the available space on the swim platform. Twin 3,150hp Caterpillar engines give her a range of 5,000 nautical miles at her cruising speed of 14 knots. Axioma is asking €68 million.